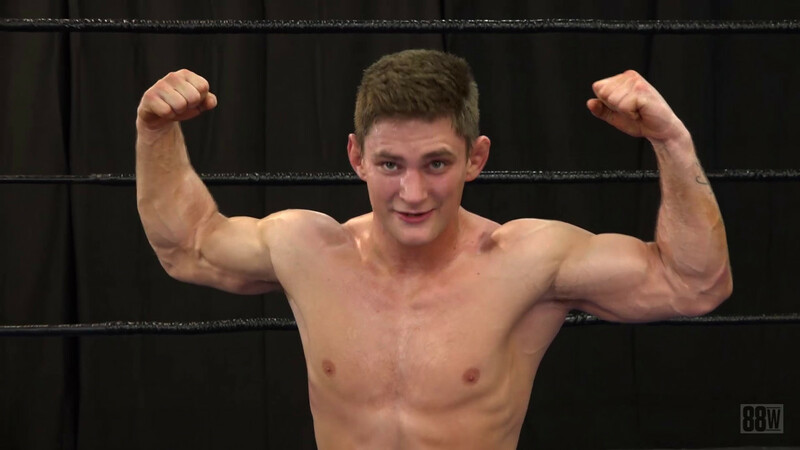 If you saw Rex Bedford’s debut match against Chase Lundquist then you realize how much he’s changed since he stepped into the ring years ago. He brings a whole new collection of colorful holds which make it stimulating to watch as you’re wondering what he’s going to do next. Today, he’s up against a rookie who retains a phenomenal, ripped body year round and also has amateur wrestling experience in his past. Jett Bentley is a gym freak and you can clearly see he knows how to create a brilliantly shredded physique. Flaunting ripped abs, a perfect chest, and bulging biceps along with his model good looks it’s no wonder he’s quite the sensation on social media. But, what we want to find out today is will he be a marvel in the ring? As the action begins in round one, Rex in his camo tights is very confident and takes the initial control with an array of both wrestling and MMA style holds on the more tentative rookie. He launches an attack on the gym freak’s hot body by stretching and pulling on every one of his limbs, including his fingers! The cage fighter appears intent on demoralizing the pretty boy early on, then going for the kill on his wounded prey. But that game plan comes to an abrupt end when Jett reverses the control. Jett’s out to show his muscles aren’t just for show in this battle as he starts putting a beating on the popular fighter. Rex suffers in a variety of sadistic surfboards, vicious body work, and a nasty crucifix which puts his perfectly built physique on full display. Can Rex launch a counter attack on his ripped rookie opponent, or will Jett stand tall and declare victory in this rousing boot camp battle? !